It was with great excitement that I was able to play with some new rubbah... the latest SU! Mini Catalog (just released Sept 1) has too many wonderful sets in them. This one I was given the opportunity to use - but all my excitement was lost when I had a moment to sit and play with it. I only got to make four cards. That is ok, sometime soon I will play again and see what transpires at that time. Some of you are probly wondering "why are you worried about snowflakes already" ... two reasons, one is that I have been making cards for Cards for Heros, which now will include my sweeties unit and second, I have to get busy making my Xmas cards so I can get pear sauce, apple sauce, and other seasonal items canned and not be behind.. (wink wink). 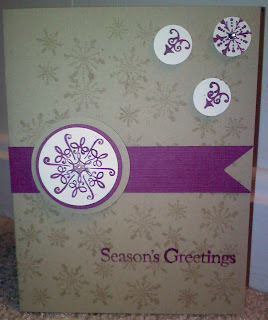 I used dimensionals on the circles, with the Raspberry cardstock. It popped just as I wante don the Kraft cardstock (I really have to put this color in a hiding place for a while, seems to be my 'go to color'). I used a pearl in the center of the the big circle. 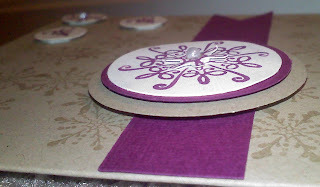 And a rhinestone in the center of the small circle on the corner. In full version, I do believe I need to spice it up alittle for my personal taste, however I must be careful of the glit and weight for CFH. I am not sold on it though, maybe I will check out other colors with it. One thing for sure is I love the Serene Snowflakes set... must have!! !